Students will organize their thoughts with opinion and reasons on plan sheets. Students can sketch or write two to three reasons to support their opinion depending on their grade or writing level. Great for ELL and students with special needs too. You could also use it for small group. 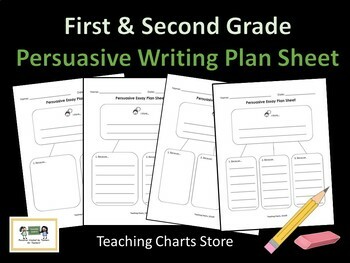 These plan sheets are also included in the First Grade Persuasive Essay Writing Curriculum and Second Grade Persuasive Essay Writing Curriculum from our store.